Whilst in Brighton for the final weekend of BREMF, we took the opportunity to catch Barry Wordsworth and the Brighton Philharmonic Orchestra in a rather imaginative Remembrance Day concert on 12 November 2017 at Brighton Dome. There was a pair of works written in the run up to World War 2, Britten's Violin Concerto with Matthew Trusler as the soloist and RVW's Symphony No. 4, plus a work by a composer who died in World War 1, Butterworth's A Shropshire Lad: Rhapsody, with Stokowski's orchestration of Bach's Toccata & Fugue in D minor making a slightly out of place concert opener. Trusler was the finely lithe-toned soloist in the bitter sweet opening to Britten's concerto, which was written in the late 1930s and premiered in New York in 1940. It is a dark and restless work, reflecting deep emotions and Trusler brought great energy and even anger to later sections of the opening Moderato whilst in the recapitulation creating something wonderfully atmospheric. There was furious energy in the Vivace second movement, along with some spectacular string crossing. The music here had a rather sardonic edge and the cadenza, which leads to the final movement, was rather austere, though still spectacular. The final Passacaglia is a big, multi-sectioned movement with some really powerful moments, but Trusler's violin was also beautifully sweet toned and tireless, it is a huge part with very little rest. The final section is perhaps the work's biggest surprise, as the bombast disappeared and we were left with the soloist alone and bitter sweet. One of the surprises of the work, on hearing live again after many, many years, was the influence of Stravinskian neo-classicism on the sound world. Throughout the concerto, Matthew Trusler was mesmerising, and Wordsworth and the orchestra provided strong support. The concert concluded with a fierce account of RVW's Symphony No. 4. The orchestra's uncompromising sound brought a strong edge to the violence in the opening movement. This was a noisy performance with the players clearly relishing the sound world. But for all that, the big violin tune had a wonderful sweep to it and the ending was atmospheric. In the second movement Andante moderato, Barry Wordsworth showed fine control of the large scale architecture and there was a lovely flute solo in the bleak final section. There was bleakness and anger in the energy of the Scherzo which led to a rather rumbustious account of the finale, broad-brush perhaps but capturing the essence. You were aware of smudgy details in the RVW, but the players' furious energy certainly carried the day and we were carried along with them. In the remaining two items, unfortunately, the exigencies of rather limited rehearsal time showed up weaknesses. So that the Bach orchestration, for all the strong sound, had too many rough edges to make this the orchestral show piece it needed to be, whilst the exposed passages in the Butterworth sounded too frail and the work failed to take wing. 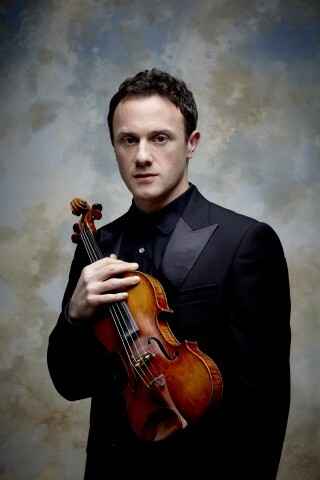 The afternoon was, however Mattew Trusler's with his mesmerising account of Britten's Violin Concerto.